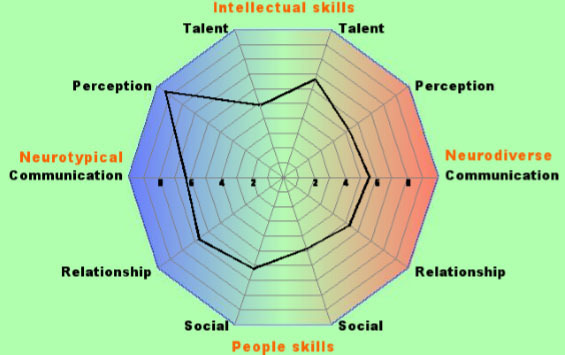 The goal of this test is to check for neurodiverse / neurotypical traits in adults. The neurodiversity classification can be used to give a reliable indication of autism spectrum traits prior to eventual diagnosis. The test uses two categories: Neurodiverse and Neurotypical. Each category has five aspects; Talent, Perception, Communication, Relationship, and Social. There's 117 questions but it seems to go fast. Answering them was fun, interesting, and helped to show different sides of the spectrum. All results are saved and entered into a main data base to track the statistics as they change over the years. I encourage everyone to take the test because 1.) it adds to the over database 2.) it helps to understand the other apsects and see how they can relate to areas of the spectrum and 3.) it's fun!